In the same year the Natives Abolition of Passes and Coordination of Documents Act was passed. In terms of this act the many different documents African men had been required to carry were replaced by a single one - the reference book - which gave details of the holder's identity, employment, place of legal residence, payment of taxes, and, if applicable, permission to be in the urban areas. The act further stipulated that African women, at an unspecified date in the near future, would for the first time be required to carry reference books. Women were enraged by this direct threat to their freedom of movement and their anti-pass campaign, as Walker puts it ‘was one of the most vociferous and effective protest campaigns of any at the time' (1991:125). Women during the Defiance Campaign 1952. Source: Jurgen Schadeberg. In June 1952 the African National Congress (ANC) and South African Indian Congress (SAIC) initiated a cooperative initiative known as the Defiance Campaign. Radical tactics of defiance were to be employed to exert pressure on the government. This was in line with the ANC's declared ‘Programme of Action' of 1949. Volunteers from the ANC and SAIC (the Communist Party of South Africa [CPSA] had disbanded in 1950) began to publicly defy discriminatory laws and invite arrest, filling the jails and over-extending the judicial system. Women were prominent in many of these defiant incidents. Florence Matomela was among 35 activists arrested in Port Elizabeth and Bibi Dawood recruited 800 volunteers in Worcester. Fatima Meer, an Indian woman, was arrested for her role in the unrest and was subsequently banned. Another woman to come to the fore during the Defiance Campaign was Lilian Ngoyi, who later became president of both the ANCWL and FSAW. 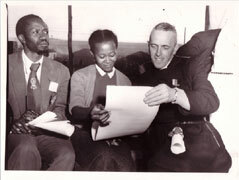 She had previously kept a very low profile and been involved in church-related organisations, but the Defiance Campaign made her realise that only by adopting a more aggressive and militant approach would the government be fully aware of the commitment of women to the national struggle for freedom. Women's involvement in the Defiance Campaign certainly proved to be an important stimulus in their political development across the board. It not only strengthened the ANCWL but also motivated women to establish the FSAW. Three important female activists were in Port Elizabeth in April 1953 at the time when the Defiance Campaign was underway and there was widespread political unrest in the region. Influx control measures had just been implemented in the region a few months before and had created a storm of protest from the people. The three women were Florence Matomela (eastern Cape president of the ANCWL), Frances Baard, who was a leading local figure in the Food and Canning Worker's Union (FCWU) and Ray Alexander, the general secretary of the FCWU, who was in Port Elizabeth to attend a trade union conference. The three decided among themselves that the time was right to call women to a meeting to discuss the formation of a national women's organisation. No record was kept of the informal meeting held that same evening, but Ray Alexander later said that it had been attended by about 40 women. Other than Alexander, a Mrs Pillay, a Miss Damons and Gus Coe, most of the women were Africans. Although from various different organisations all the women were committed to the Congress Alliance and the Defiance Campaign that had been initiated the previous year. Ray Alexander pointed out the advantages of an umbrella body that would devise a national strategy to fight against the issues of importance to women: every-day matters such as rising food and transport costs, passes and influx control. The women were enthusiastic in their response and Ray Alexander was asked to pursue the matter further. Ray Alexander was based in Cape Town so the planning for the initial conference was done there. Hilda Watts (Bernstein), also a communist and an experienced political campaigner, was asked to handle the Johannesburg wing of the committee. Subsequently Johannesburg and Cape Town were to become the main FSAW centres. An energetic, skilled organiser who had been a tireless campaigner for women's rights since the 1930s, Ray Alexander was the ideal woman for the job. She co-opted a number of influential women country-wide to help her but her individual contribution was enormous. All the major organisations were represented in her ‘women's committee' including the ANC Women's Leaguers, trade unionists, members of the SAIC, of the Transvaal All-Women's Union and of the Congress of Democrats (COD). The COD had been formed when the CPSA had disbanded in 1950; it thus included many of the ex-Communist Party members. By the time the FSAW had been established in 1954 the Defiance Campaign had fizzled out. This is not to say that it had failed, despite it shortcomings. However, the government had weathered the defiance and was introducing yet more of its apartheid measures with persistent vigour. It became clear that the national liberation movement needed to adopt a new initiative. The Congress Alliance began to organise the Congress of the People; once again women were destined to play an important role. This despite the fact that many of the leading women activists in the ANCWL and FSAW including Ray Alexander, were banned and had to cut their ties with the organisation. In September 1955 the protest against the imposition of passes for women became the primary concern for the ANCWL and the FSAW but for black women across the board. This anti-pass campaign peaked with a massive demonstration of ‘women's power' in August 1956. After the Pretoria march the campaign continued until the end of the 1950s, within Zeerust in 1957, Johannesburg in 1958 and Natal in 1959. In 1960, as will be seen, FSAW's plans were abruptly halted in the wake of the Sharpeville unrest when the government banned the ANC. FSAW had been dealt a severe blow. The Federation of South African Women (FSAW) that had been formed the previous year was beginning to assert itself by 1955. It was by now an accepted organisation within the ambit of the Congress Alliance; regional branches had been set up and mass membership was growing throughout the country. Furthermore, it had links with other major women's organisations including the powerful ANC Women's League (ANCWL). 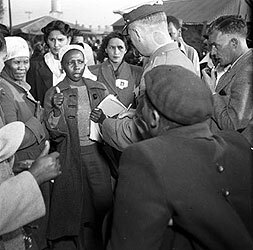 A march to Pretoria to present women's grievances had been mooted in August 1955, and when the pass issue came to the fore in September the scale and urgency of the demonstration increased dramatically. The success of the October 1955 gathering was highly motivating and buoyed up the women to capitalise on their success. From 1955 onwards, the pass issue became the single, most important focus of their militancy. The ANC, as the major anti-government party identified itself closely with the campaign reiterating that the pass struggle ‘was not one for women alone, but for all African people'. However, at its annual conference in 1955, it did not appear to have a specific strategy in mind. In marked contrast the FSAW immediately set about working on a plan of meetings, demonstrations, and local initiatives. The women, carried along by a mass-following of females countrywide, recognised the authority of the ANC but were not prepared to delay their own preparations. The organisation of this event was to culminate in the 1956 Women’s March.